We stayed at Hotel Barons, which offers small but clean rooms (and in our case a balcony!) and a central location in the old town. We joined the afternoon Tallinn Free Walking Tour to get a feel for and history of the city, walking from Freedom Square up to the upper town (Toompea) past Kiek in de Kök to see Parliament, Alexander Nevsky Cathedral, and St. Mary's Cathedral. The streets of the upper town are a bit quieter than in the lower town, especially in the morning and evening. Best yet, the edge of the upper town is sprinkled with viewing platforms from which to appreciate the views; we visited Piiskopi, Patkuli, and Kohtuotsa. We ended the tour in the city’s famous Town Hall Square (Raekoja plats), one of the most attractive in Europe. On our own we walked from the northern end of the old town at Fat Margaret, down to St. Olaf's Church (and up the tower!) and along the western city walls, snaking through all the side streets. As busy as the main parts of the old town are, some of the side streets are completely empty; we especially liked Kooli for its worn charm and complete lack of crowds. We also visited St. Nicholas' Church and Museum for its ecclesiastical art, on display as part of the network of Estonia’s national art museum. Our guide for the walking tour recommended a visit to Telliskivi Creative City for another perspective of Tallinn. We walked past the main train station and along the pedestrian and cycling lane at 59.440281, 24.733546 to get there. The area is a regenerated industrial and warehouse district chock-full of markets, stores, studios, restaurants and cafes. We trawled through antiques, window shopped at the many pop-up concept store, and even got a sneak peek at the workshop of a leather store! The area seemed wildly popular with hipsters and families alike, and we can only imagine how much its popularity will grow as it expands and continues to market itself as a must-see (which it is). The food in Tallinn was amazing. We seeked out vegetarian-friendly places, so our picks are biased in that direction, but we’d wholeheartedly recommend any of these restaurants to vegetarians and carnivores alike. We stopped for lunch at Rataskaevu 16 (beef tenderloin, butternut squash) and Kompressor (pancakes). Dinner was had at Vegan Restoran V (veggie Thai curry, spicy tacos, beetroot ravioli) and Von Krahli Aed (beef tenderloin with rice, kale, and mustard; kale rolls with hummus and apples; carrot cutlet with mashed potatoes and veggies; chocolate lava cake with beetroot ice cream; panna cotta; Estonian cheese plate); the latter was so good that we went twice! Lastly, keep your eyes out for Kalev chocolate in the grocery store (a local favorite) and the local Öunalimonaad Rabarberiga drink (natural lemonade with apple and rhubarb juice, made on the Estonian island of Saaremaa), both of which are so tasty (though probably not together…)! 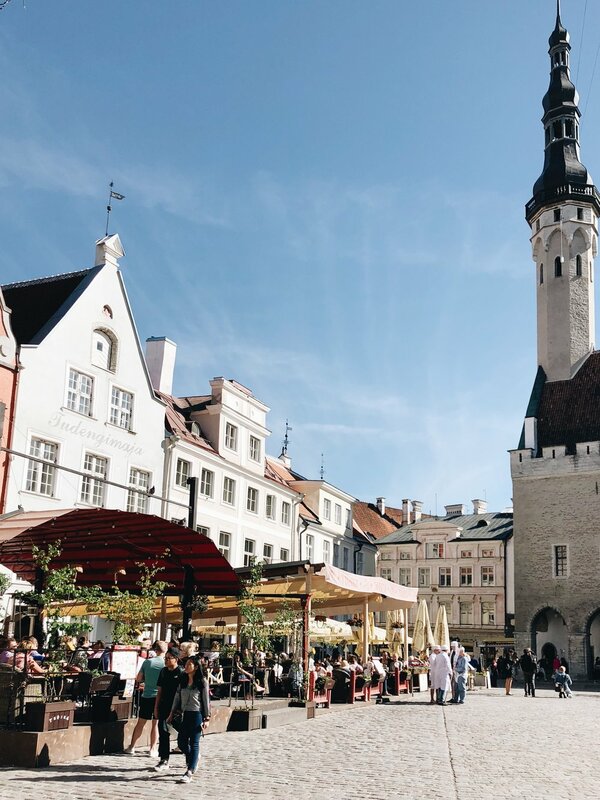 Stayed tuned for a look at our day trip to Tartu, Estonia’s second city!